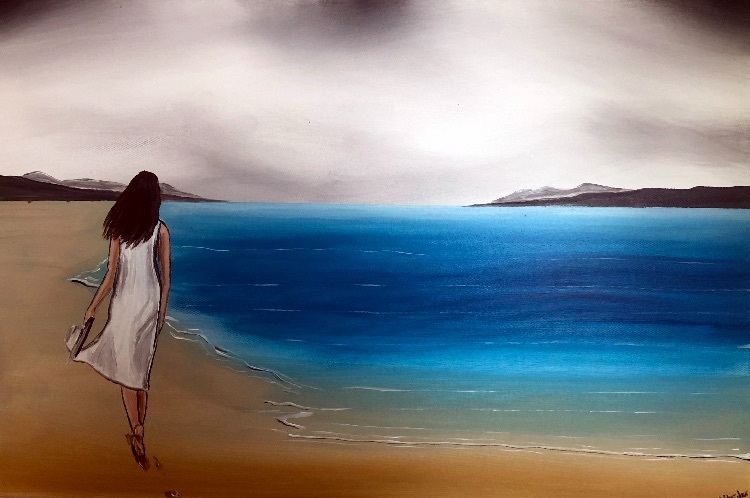 A woman strolls along the beach by the blue sea as devoting this personal time just for herself and her thoughts. The grey clouds work beautifully in contrast with the teal blue sea. This paintings carries on over the sides so it may be hung without the need for a frame and the art has been varnished with gloss for protection. The canvas is wired at the back ready to be hung and has been signed in the bottom corner by the artist. The painting will be carefully packed into a custom made box and will deliver within 2 working days by a tracked courier. Comes with a certificate of authenticity.